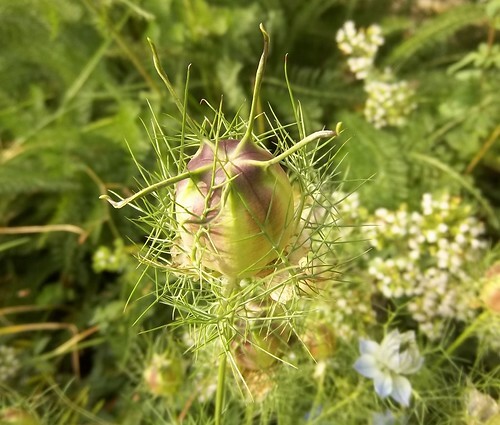 This love in a mist came from seeds shared by my Auntie Ruth, many years ago. I was thinking today that the many plants I have in the garden, from seeds or starts by various relatives and friends, is another way to honor and remember them. How wonderful to have memories of loved ones live on in living plants and the changing seasons. great picture of an interesting subject. Wow little tiny flowers can give many seeds again. Great one! Lovely macro. Beautiful sentiment also. that's a great find and nice picture! One of my Mellow Yellow entries can be found at Spice Up Your Life, come by when you get a chance, thanks! I do that too I have flowers for my dad. Nice macro shot. Very interesting plant and I love your thoughts about memories of the loved ones who gave you starts. I have a few plants from my parents old place that will always remind me of them too. Lovely poetry as well.